It’s Day 100 of the #365drawingchallenge and I’m celebrating with Hellboy Week and my favorite comic book character, the titular Hellboy! 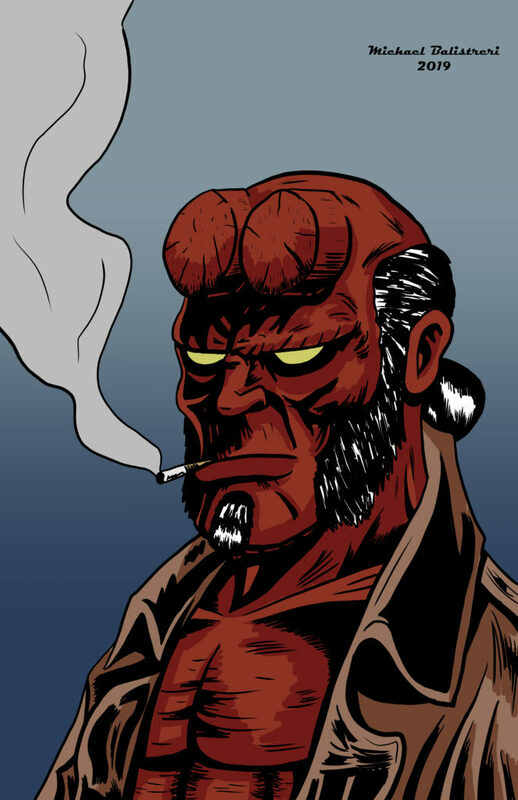 Normally I only work on my own comics, but if I could choose any other comic to work on it would be Hellboy. It just hits so many things I really like. The horror, the settings, the supernatural elements, the gruff blue collar lead, plus a bunch of other stuff. It just all comes together so well. Another thing that I love about Hellboy that isn’t true of most comics is that it is very consistent. There aren’t a ton of alternate versions or reboots to keep track of. It’s all fairly straightforward and manageable. I own almost the entire series, including what spinoffs and one shots they’ve done, and it doesn’t take up a whole room. Imagine owning the entire Batman, Spider-man, or Superman series. You’d need a whole house just to store it. The consistency extends itself to the world building, which is handled really well. If something major happens in a story then it impacts the world from then on. It makes things feel more grounded and impactful. It gives more meaning to actions. It creates a wonderful universe that I think rivals Marvel or DC.